For many decades, the way gas-powered furnaces lit their burners was with standing pilot lights. Although an effective method of starting the heating cycle, using a standing pilot light drains additional power and lowers a furnace’s efficiency. Most contemporary furnaces have an electronic ignition system instead of a pilot light. Electronic igniters either use a spark (intermittent pilot) or a heating element similar to a light bulb filament (hot surface ignition) to turn on the gas jets along the burner. Although electronic ignition systems are generally more reliable than pilot lights, they can still encounter problems that will require professional heating repair in Columbus, OH to prevent a loss of heating power. Quality Air Heating and Air Conditioning is ready to help you any time of the day or night when you have problems with your home’s furnace. Improper handling: You should only let professionals handle electronic igniters. Improper handling can cause oil from your skin to get on the heating elements, which will cause them to crack. Bad wiring or outlets: Electronic igniters can suffer from the same troubles as any electric system; crossed wiring at the junction box or issues with the outlet powering the ignition can cause it to stop working. Integrated circuit board failure: The integrated circuit board monitors the operation of a furnace and controls the electronic ignition. These circuits can fail and prevent the electronic ignition from coming on. Fortunately, LED readouts on your furnace can alert you when this happens and provide a failure code that will help your repair technician find out what is wrong with the circuit board and fix it. Age: The ignition system for a furnace is not expected to last as long as the furnace itself, and age will eventually cause it to break. Igniters tend to last about 3–5 years before they stop working because of cracking. The best way to prevent this from causing trouble is with yearly maintenance visits from a technician. Maintenance technicians are trained to detect when an ignition system is near to failing and so they can replace the igniter. Working on an electronic ignition system for a gas furnace combines two areas you should never work in without training and the right equipment: electricity and natural gas. 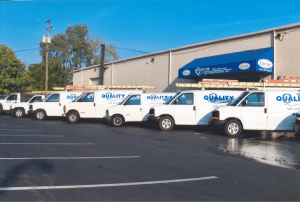 Quality Air Heating and Air Conditioning has the right kind of professionals for heating repair in Columbus, OH: NATE-certified technicians with training that goes above and beyond to make sure you stay warm and safe with your electronic ignition gas furnace.